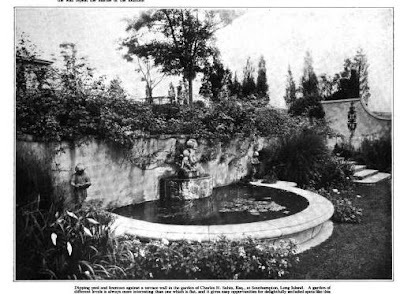 A fountain in the gardens of 'Bayberry Land', the Charles H. Sabin estate designed by Cross & Cross along with Marian Coffin c. 1918 in Southampton. Click HERE and HERE for more on 'Bayberry Land'. Photo from Country Life, 1922. I was glad to see the photos and comments from the previous posts on this wonderful house. It is hard to believe that it survived until so recently before being torn down. From what I can tell from the Google Earth view: not the fountain nor anything else of 'Bayberry Land' survives on the grounds of the Sebonack Golf Club -- please let me know if I'm wrong. It seems a more painful loss because it was so recent. And what an evocative fountain! In case you have not seen it - check out Devoted Classicist's post from yesterday on the Nissim De Camondo Museum. Some wonderful floor plans and interior photos of a grand Parisian townhouse. Painful loss indeed. It was a house of national importance and should have been saved for the ages (although the exterior and landscape were severely compromised by the end). A major convergence of talents. How marvelous that fountain is....everything designed to perfection, maintained 'just right'...sad, very sad. When I think about how beautiful that fountain is and how beautifully landscaped the gold coast mansions were, I have to wonder if the owners really spent much time sitting outside and enjoying what they had. ChipSF, thanks for letting me know about Classicist's posting. In places the interior decorating is a little extravagant for my taste but the exterior is excellent & the floor plan is even more excellent. Classicist, thanks for sharing. ChipSF, I looked at your blogger page & see you work in real estate in San Francisco. In case you’re not familiar with her there is a SF Realtor, Malin Giddings at http://www.sfproperties.com whose listings include floor plans. Very beautiful listings & very interesting to see how people go about updating older properties, especially when there is usually limited space (which is often verticle) & per square values are very high. Thanks for the tip! I'm not involved in residential, but I am familiar with Malin. She not only has a great website, but over the years she has consistently had some of the best listings in the city. Good call!